With Israeli Prime Minister Ariel Sharon and Palestinian President Yassir Arafat linked by bloodshed yet again, it has become apparent that the violence in the Middle East never ends, but waits patiently, biding its time to come again, and again. As the circle of violence continues, Jewish relatives of victims mourn their dead, while Palestinian mourners grieve over their dead. What is the history of this circle of violence? What is daily life for Jewish and Arabic inhabitants of Israel and Palestine? 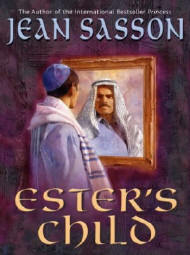 Jean Sasson�s latest book, ESTER�S CHILD, reveals the compelling truths of the lives lived by Jewish Holocaust survivors who fled the violence of Europe as well as the lives lived by Palestinian refugees who fled the violence of Palestine. In ESTER�S CHILD, the international bestselling author of the Princess Trilogy shows that she is a brilliant storyteller. Her latest work of historical fiction reveals layers and varieties of hate and love seldom seen in popular fiction. Both plot and character driven, ESTER�S CHILD, is a passionate book with several love stories set amid the twentieth century�s most dramatic historical events, from World War II to the current conflicts in Israel and Palestine.